Often times we see parents of children with ASD (Autism Spectrum Disorders) comparing their child to her peers. They assume that if a peer has been fully mainstreamed and their child is still struggling with one subject in mainstream, they would consider it a failure on their part as well as the child’s. The reason the word “spectrum” was chosen to define the condition, was mainly because of the wide variety of signs demonstrated by individuals with autism. Generally speaking, they all share some common traits like repetitive behavior, inflexibility, poor social skills, and poor communication. However, the academic (cognitive) level, the severity of behavioral problems, and sensory integration issues can be so distinct from one child to another. 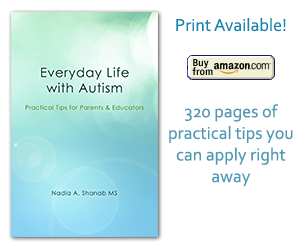 Endless factors play a role in raising and educating a child with autism. Don’t compare your child to any other child. Your child is who she/he is. You are who you are. Celebrate the smallest success. Like a snowball, success starts small then keeps growing bigger and bigger. Growing up is not easy for anybody (on and off the spectrum). Remember that even neurotypically developed children (NT) have their challenges too. It is not always as easy for them as you may think. The only thing you have control on is your perspective and attitude. If you decide to look at the whole situation as a mishab or misfortune, you’ll be complicating things more than it is needed. If you adopt a positive attitude and realistic perspective, the entire world with collaborate to move things forward and achieve more success. Kids develop at a different pace. Time is working to your favor, get the best out of it.